In Partnership with SIX Payment Services, Bluebird provides the full suite of acquiring and transaction processing for Government and Transportation merchant as well as specialist in the Hospitality environment in association with the BIP-1500. Bluebird's Pidion® BIP-1500, designed to provide more choices of hardware platform as per each business need, includes 2" or 3" thermal printer and multiple data collection options including built-in GPS, Camera, Barcode Scanner. For field use purpose: BIP-1500 supports IP 54 and 1.5 m drop resistance. 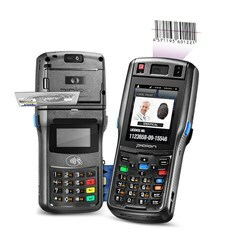 For secured payment and transaction function: built-in PIN-pad with MSR, Smart Card reader and Contactless reader or built-in Biometric reader (optional). SIX Payment Services provides innovative payment solutions and has certified the BIP-1500 at the major card schemes for its card acceptance. “SIX Payment Services is proud to incorporate the Pidion range of products provided by Bluebird Inc. into our market, leading hospitality and travel delivery payment services. With this additional device and its clear leading position in integrating mobile ticketing, food & beverage sales and specialist applications, SIX and Bluebird shall still further improve the quality of service it provides to our clients and their customers,” said Peter Antl, Head Business Development, SIX Payment Services. Bluebird Inc. is a leading provider of payment terminals and enterprise mobility with more than 3000 customers in over 120 countries. Bluebird provides a wide range of solutions for supporting banks, retailers and service providers to secure their electronic payments solutions, optimize workforce productivity and enhance customer interactions. Headquartered in Seoul, Bluebird operates local offices in USA and China. More information can be found at http://www.mypidion.com/. SIX Payment Services provides financial institutions and merchants with secure, innovative solutions throughout the cashless transaction value creation chain. As one of Europe’s largest transaction processors, SIX Payment Services supports financial institutions with the end-to-end processing of their card transactions and interbank payments. With its state-of-the-art IT infrastructure, SIX Payment Services ensures an efficient and secure transaction flow between the cardholder, card issuer and merchant. It facilitates the acceptance of cards at the POS and in e- and m-commerce with its modular offer. Beyond Europe, SIX Payment Services offers its broad range of PSP (Gateway) solutions to provide integrated card processing in both card-present and card-not-present environments. Its offering also includes electronic billing and direct debiting. All services are based on the latest international security standards and provide optimum fraud and risk protection.